At 2116 hours on the 4th November 1942, Lockheed Hudson Bomber A16-173 dispatched from Camden RAAF Base NSW crashed into the side of Bong Bong Mountain located behind Dapto NSW with the loss of all crew members. On the 4th November there was a report of an enemy submarine sighted of the coast of Sydney. Two Lockheed Hudson Bombers from 32 Squadron were dispatched from the Camden RAAF Base to investigate the reported sighting and engage the enemy once located. Due to adverse weather conditions the A16-173 lost bearings and found them flying over the Illawarra area. It is alleged that the crew mistook the water mass known as Lake Illawarra for Botany Bay. The escarpment or mountain area west of Illawarra has an elevation of between 709 metre’s (2,326 ft) to 803 metre’s (2,635 ft). In adverse weather conditions, cloud and fog covered the mountainous and cliff face areas of the Illawarra Escarpment. A16-173 circled over the Unanderra, Dapto and Albion Park area for a period of time trying to obtain a location bearing. Various AIF Camps including the 6 Aust. Inf. MG Batt, tried to advise the crew by way of aiming search lights towards the Bomber and quickly flicking the search light upwards to indicate for the crew to climb in altitude, but to no avail. Since 2008 The Albion Park Squadron, Australian Air League has held remembrance services for the crew of A16-173. On Sunday 15th June 2014, The Albion Park Squadron accompanied by Cadets from Sutherland Squadron embarked on a trek into the Bong Bong Mountain to visit and undertake a remembrance service for the crew of A16-173. The day started with a debrief and power point presentation outlining the Lockheed Hudson Bomber and the history of how the aircraft was designed from the Lockheed Model 14 Super Electra passenger airliner undertaken at the Dapto RSL Hall. History of how the Hudson Bombers were transported to England and Australia and various Squadrons who flew the aircraft and Squadrons who were also based at the Camden RAAF Base was also discussed. At 11am the Albion Park Squadrons accompanied by Cadets from Sutherland Squadron embarked on their trek to the crash site. 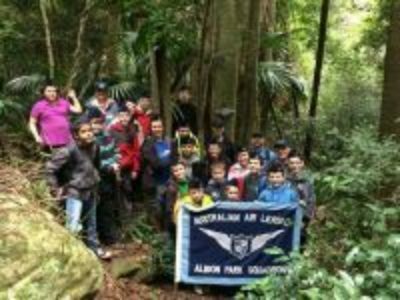 Cadets and Officers, accompanied by some parents hiked into the mountainous area with a stiff, brisk Southerly wind and rain, guided by Scott Fleming from the Illawarra Historical Society. Once we reached the base of the Rain Forest it was nice to be protected from the cold wind and rain, only to be greeted by Stinging Nettles, Stinging Trees and Leeches by the thousands. Cadets, Officers and Parents from Albion Park Squadron and Sutherland Squadron undertook a formal remembrance wreath laying service at the crash site, remembering the crew of A16-173 and all Service Men and Women who have served. At the conclusion of our service, we trekked further into the mountain to visualise wreckage that remains at the site which included exhaust manifolds, wheel strut, engine cowling and parts of the fuselage. The Albion Park Squadron, Australian Air League would like to thank the Committee and Members of the Dapto RSL Sub Branch who allowed us to use their Hall for our debrief and approval to visit the crash site.